Want to purchase your very own Designed Wearable Jade Carving. Design and then watch as your Design is drawn onto the stone color you selected, then see your Special Design take shape as Gordon carves your design into Reality, and is then Hand Polished to Perfection. You go home with a Special Treasure that you personally saw created from the Jade Stone which will last a Lifetime Allow at least 6 to 9 hours for this Activity. Design your own Wearable Jade Design,Put you ideas onto paper, then choose your design. Next you will select your color of stone you would like. 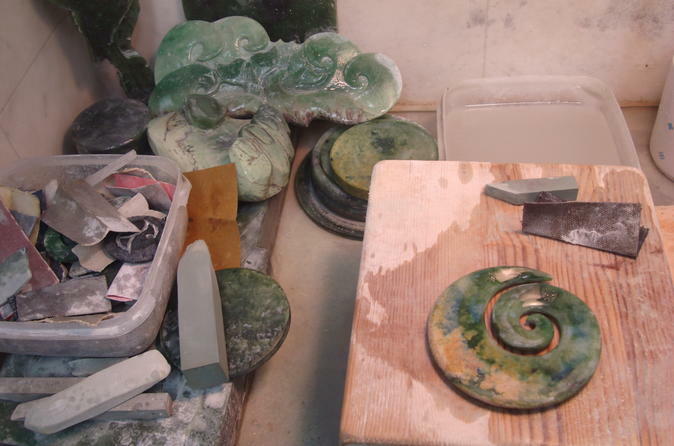 Watch as your design then goes from paper to stone and is transformed into a beautiful Wearable Jade Carving by cutting with diamond saws, grinding with diamond wheels, and carving with compressed air carving tools using very fine diamond drills. Finally your design is Hand Polished using silicon carbide rub stick and then 120, 240, 400, 600, 1000, 1500 micron diamond polishing paper and final dry paper 2000 and buffing with special magic powder 10,000 micron to bring your designed Wearable Jade Carving to perfection. and it is then presented to you to wear and admire for a lifetime.